Dashboards are consolidating data from different stores and restaurant locations to summarize and analyze the sales across all the units. Easily measure key KPIs like sales per day, average check-ins versus sales and guest count by location to make impactful marketing decisions to boost profit. We developed a Power BI solution by extracting data from APIs and feeding them into Power BI for the analysis. Our solution summarized statistics on how all stores and restaurants were performing in sales, guest visits, and several other attributes. 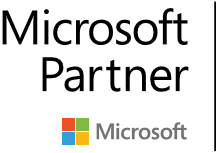 After taking data from their APIs, we designed a hybrid Microsoft Azure-based database which consolidated all of their data, then imported all the data into Power BI desktop to create reports. The analysis of Sales and Guest count by location uses a combination chart for each hour and can be filtered using a slicer at the top. Power BI's bookmarking and buttons features allow easy navigation BACK to the previous page and the NEXT page, and a RESET button can be used to clear all filters applied to the tab. 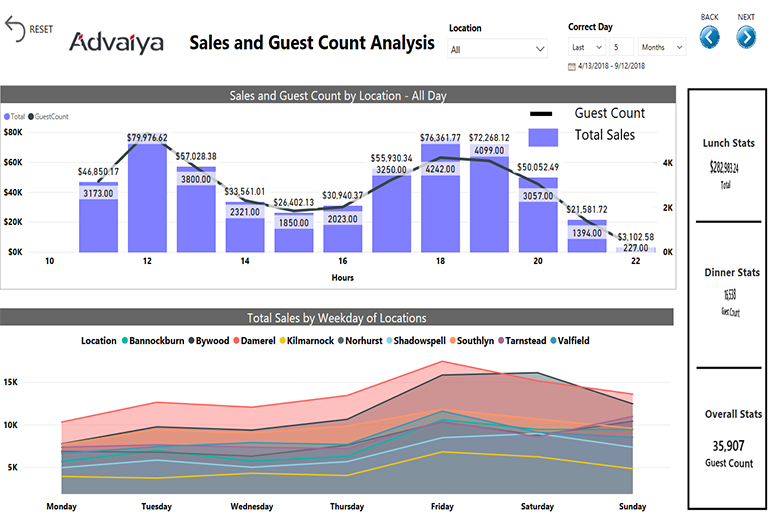 Owners see a more granular view with the Total Sales by Weekday of Locations chart, and the overall status of lunch and dinner revenues, the values of Guest count and Total Sales are displayed using rotating tiles. Top Selling items can be filtered using a slicer to measure which food item is providing the most revenue. 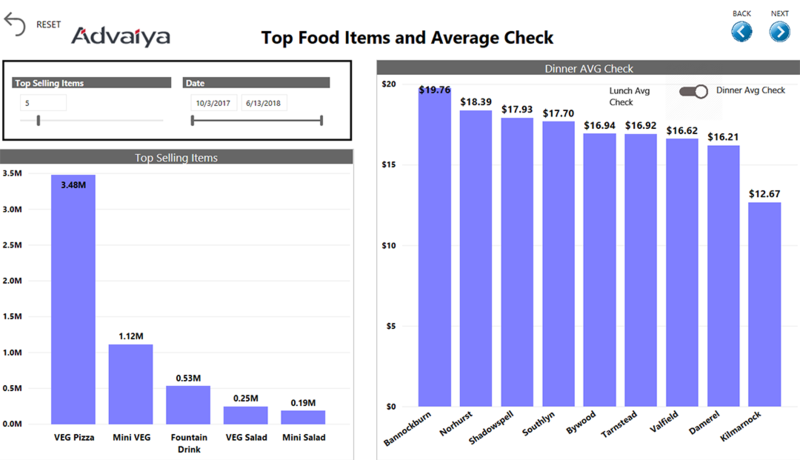 which also shows lunch and dinner average check amount with just a click. Finally, there is an analysis of Pizza and Burger orders. The column chart shows the percentage of Total Sales of Pizza v/s Burger in Dinner by each location. 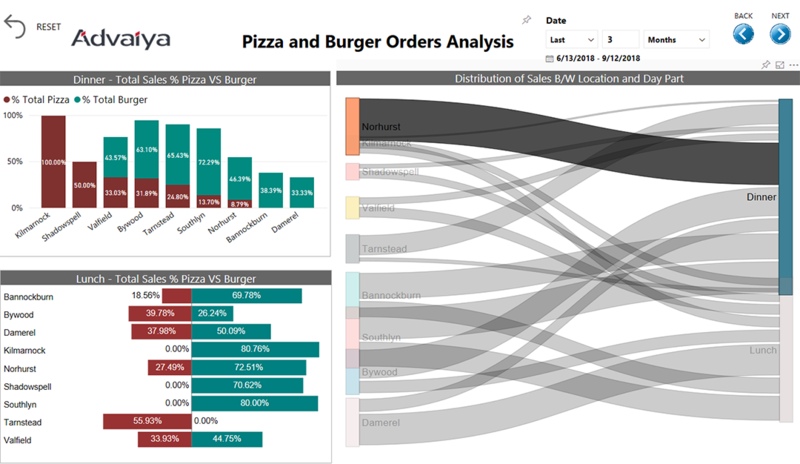 The Tornado chart compares the percentage of Total Sales of Pizza v/s Burger in Lunch by location. The Sankey chart displays the distribution of sales for lunch and dinner from every location.